It is less than two years since we published a 24-hour Forest Gate food trail (see here), and we struggled to find half a dozen decent places to eat in the area. That number of additional outlets has popped over the last three months alone, to add to the mix of food and drink options within the E7 postcode. This article traces the changes and reviews some of the more interesting possibilities currently on offer in Forest Gate. In many senses the origins of the recent local food boom can be traced back to the opening of the Forest Gate Market in December 2011. The market now, among its varied stalls, sells organic vegetables , a delicious cheese stall (Forest Grater) and charcuterie outlet, with occasional appearances from an Essex organic farmer. There are, additionally, food evenings and appearances by other hot food hawkers at different points during the year. The first modern coffee shop, Kaffine (now sadly gone, but replaced by Familia), popped up soon after the market opening, to be followed in 2013 by CoffeE7, Aromas on Forest Lane, Artemis (the coffee and crepe rotunda outside the station, closed while the newly-named Elizabeth Line is being developed) and the Forest Tavern. The following year Compotes, the Wanstead Tap and Woodgrange Road's Afghan restaurant (now gone and replaced by a Peri Peri chicken shop) appeared for the first time. The international food chain Subway, too, opened up at the foot of Woodgrange Road. 2015 saw the demise of the Siam Cafe but the beginnings, underneath the arches in Winchelsea Rd - in close proximity to the Wanstead Tap - of Hawkes, the innovative cider brewers. They soon linked up with Wanstead's Lupollo, to offer a drink and pizza weekend dining option. There have been half a dozen openings locally since the end of last year, most of which we have visited, and we provide a quick survey of what is currently on offer. The restaurants and bars are listed, below, in no particular order. This is just a couple of doors down from the now departed Siam Cafe, at the northern end of Woodgrange Road. It is small and pleasantly decorated. It has a ridiculously large menu selection, but the food is all freshly cooked - and delicious. It will certainly give Aromas (just round the corner, and winner of a Time Out restaurant award last year) a run for its money. It's difficult to assess how well it will do, as there isn't much space for diners, their on-line marketing - in what is becoming a crowded market - isn't great, and its hasn't seemed too busy whenever we've passed. But we thoroughly enjoyed the good prices, decent sized portions, range of choice, pleasant swift and helpful service and most of all the food. As a BYO restaurant (with an off-licence opposite), diners can save money on alcohol consumption there. It has become our local Indian of choice. Much trailed and incredibly well located, this new venture has stepped up the ante in Forest Gate dining terms. It is a pizza house, coffee shop and delicatessen rolled into one. It is owned and run by two local young women with great catering/hospitality CVs. It's a gamble and must have cost a fortune to furnish so tastefully and well (Epping Forest wood table tops, chairs covered by Robinson's, Upton Lane's great local upholsterers). It is staffed by local labour, offers home made products and uses local suppliers for many more. What's not to like? Well "anarchist" vandals daubed the windows with graffiti during its opening week, presumably objecting to people having some local choice of eatery in a food outlet that, unlike Starbucks, say, will end up paying UK taxes when it becomes a viable proposition. The main attractions are the pizzas - more expensive than the other local options. But infinitely better: freshly cooked with great and generously portioned ingredients, and totally delicious. As the CK develops, it is extending its range of offers, there are now anti-pasto starters and some great cakes for desserts. Some tasty take-away sandwiches are being offered for the passing trade. The charcuterie range is beginning to expand. The downstairs dining area options are gradually being developed; as a side-line it features fun activities for under-fives a couple of times a week, meeting the needs of the young mum owners, at the very least! Forest Gate's super chef, Michael Sanders is running his Supper Clubs from there, starting this week. The match up with Michael, who launched himself locally with these clubs at the Wanstead Tap in 2014, followed by pop up sessions in pubs in Leytonstone and Stratford last year, is a great one, in which both chef and owners deserve to prosper. His prices are a bit up on those at the Tap, but the location is more convenient and the ambience more up market. On the drinks front, the all-day coffees are delicious - they need to be, as there's plenty of competition, locally on that front. There is also a range of craft beers and ciders available, together with an extensive (and expensive) wine list - featuring many organic products. The venture is a great addition to Woodgrange Road and deserves to succeed. Perhaps more than all the other newcomers, judging by its popularity, it seems to typify what the recent incoming residents to our neighbourhood want from local dining: good ingredients, great atmosphere, convenient location and plenty of look-alikes as fellow customers. The longest-operating of the new local eateries, perhaps sensing a bit more competition, has recently branched out, with its After 7 at CoffeE7 on Thursdays - Saturdays. The offer is simple: some fine cocktails and a range on bottled beers and ciders and wines plus a very limited, but extremely delicious nocturnal (7pm - 11pm) food range. There is a great charcuterie board and cheeseboard, supplied by a couple of the stalls on Woodgrange market (see above) on the menu and an absolutely delicious veggie Weedburger (seaweed), with sweet potato fries and side salad. They are all very reasonably priced, and the three, shared between a veggie and a carnivore, make a delightful light evening meal. Very highly recommended. We'll be back! This small enterprise on the corner of Woodgrange Road and Forest Lane has replaced the original Kaffine coffee house. It suffers the same problem: a small dining area, but offers - like its predecessor - great coffee, tasty cakes and imaginatively loaded sandwiches. It has a limited, but interesting, lunch selection and more customer friendly staff/owners than its forerunner. We hope it succeeds - but it is in an increasingly crowded market. This is next to the aforementioned Robinson's on Upton Lane (in SoRo, as the local hipsters would have it). They opened with a soft launch last week and have a mouth-watering menu of "fresh, wholesome and comforting food with a unique blend of flavours", as the blub has it. There are half a dozen, reasonably priced starters (£3.95 each, or 3 for £10) and half a dozen delicious-sounding pies, each with 2 sides, for £7.95 as the main attraction: these include chicken, lamb, fish and veggie. The ingredients are exciting and the food looks great. For non-pie eaters there are half a dozen other offers, including burgers and fish and chips. The drinks (non-alcoholic) and desert (limited selection) are reasonably priced too. A three-course meal and drink can be had for well under £20 a head - so a more than decent meal at an even better price! This is on Cann Hall Road, just outside E7, but within easy view of the edge of Forest Gate's part of Wanstead Flats. It is an upmarket cafe, providing a wide choice of fresh breakfasts (English and continental) - but being Halal, no bacon is on offer. The sandwiches, home-made cakes and interesting lunchtime soups look tasty and mouth-watering. A pleasant stop after a ramble round the Flats; it even has some outside seating, on which to continue to enjoy the healthy outdoors. Highly recommended. Antic, the brewery that took over the down-at-heel Railway Tavern and turned it into Forest Gate's liveliest pub - the Forest Tavern - a little over two years ago, is looking to breathe life into two other old and famous boozers in the area: Manor Park's Earl of Essex and the Lord Rookwood a couple of doors down from the Lakehouse Tea Room on Cann Hall Road. These are huge pubs with fine traditions, both now, unfortunately closed. It will be a big ask to turn them around, but it seems like Antic intend off-setting some of their investment costs by building (and selling) flats in and around them - half a dozen 1 - 3 bed flats on the upper floors of the Earl of Essex and flats in the car park/grounds behind the Rookwood, if rumours and early plans are to come to fruition. As with all Antic pubs, an interesting food offer will accompany the drinking options, once opened. But given the linked-in flat construction plans it could be some months before food and drink are flowing in them. The real E7 challenges for Antic - or another enterprising pub chain - however, would be to revitalise the Live and Let Live, currently dry (but squatted in? ), on Romford Road or even to do something truly innovative with one of Forest Gate's most iconic buildings, The Old Spotted Dog, on Upton Lane. As far as the Old Spotted Dog is concerned, members of the trust established to save it met with the site's new owners at the end of last year and discussed the developers' plans. These include building low rise flats in the car park area and beyond, and refurbishing the pub, before selling it on. The attraction of building flats for the new owners is plain and lucrative to see; vigilance will need to be maintained to ensure that the more important historic parts of the development are sympathetically restored to something approaching former glories. Over 95% of the contents of this site - indeed what is known about Forest Gate - relates to developments over the last 150 years. This article features a much older piece of local history. While sewers were being constructed behind the Princess Alice pub, at the junction of Romford and Sprowston Roads, in 1875, workmen came across a small gold shiny object. 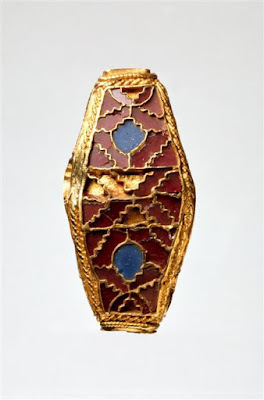 It was soon identified by archaeologists as a Saxon jewelled pin, dating from the 6th or early 7th century A.D. The craftwork on it indicated that it, in all probability, belonged to a woman of high status. Essex - of which Forest Gate has been part - was then an independent kingdom, stretching over the current area of the county and incorporating Middlesex and parts of modern Hertfordshire. The pin was a one-off find, suggesting that it hadn't come from a local house, or settlement of distinction, or was a burial object. Rather, it was likely to have, in some way, been lost by a traveller on what was the old Roman London to Colchester Road (today's Romford Road). 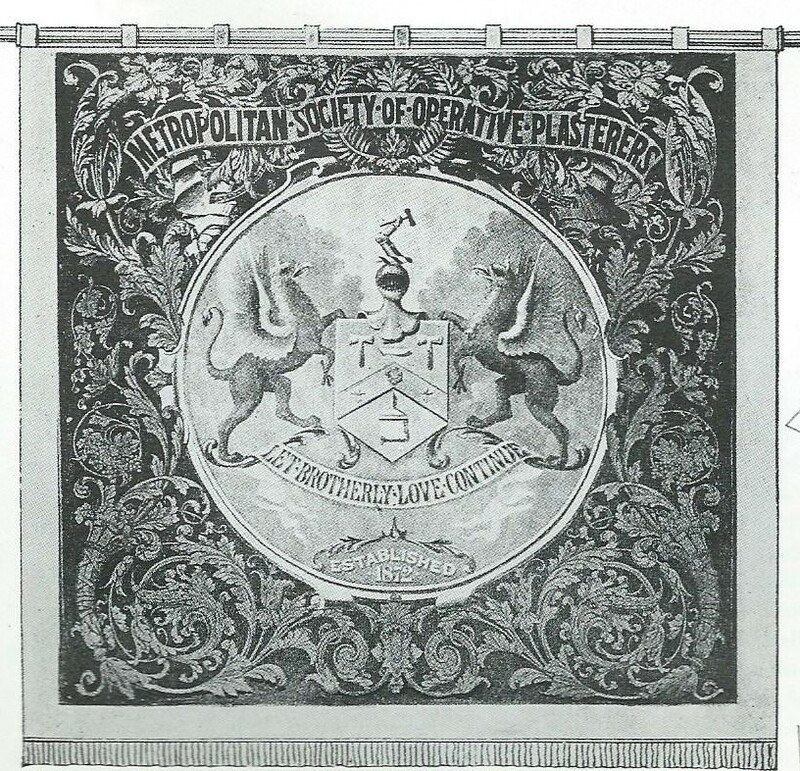 It was soon acquired by Sir John Evans (1823 - 1908), an archaeologist who had married into the wealthy Dickinson family of paper and stationery manufacturers. Sir John was very much a "society" man, when such characteristics were fashionable and given high status in the late Victorian era. He was, in turn, a prominent member of British "societies" concerned with: antiquities, geology, anthropology, chemistry and science. He was treasurer of the British Society for 21 years and a trustee of the British Museum. The pin was transferred on his death in 1908 to his son, Sir Arthur Evans (1851 - 1941), who presented it to Oxford's prominent Ashmolean Museum the following year. 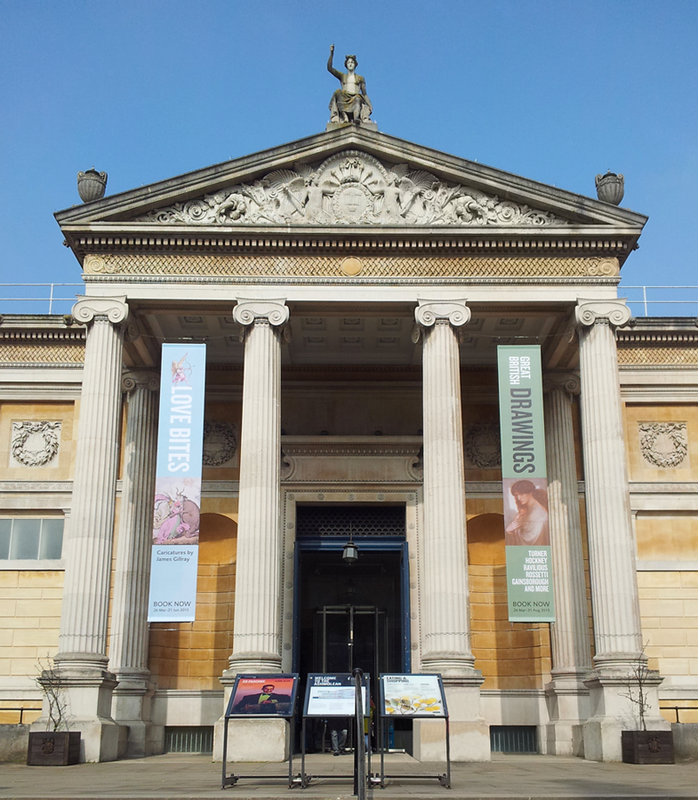 Sir Arthur, himself, was an archaeologist who was appointed keeper on the Ashmolean in 1884. 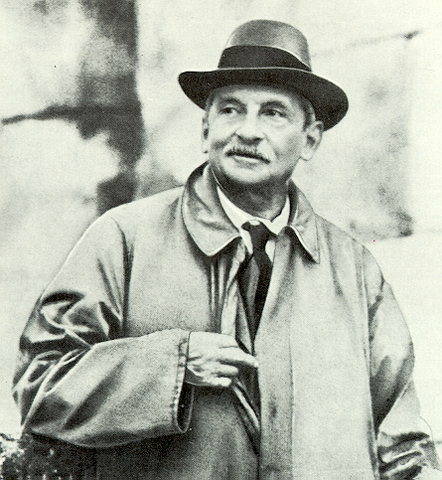 He steered the institution in the direction of his principal interest - archaeology. He is, perhaps, best known for his excavation of, and considerable research into, the relics of the Minoan civilisation of Crete. Back to the pin. Work by the Evanses and the curatorial staff at the Ashmolean suggests that the pin is stylistically similar to jewellery produced in Kent in the late 6th century. This is acknowledged to have influenced designs in Essex, following the marriage of King Sledd of Essex, to Ricula, the sister of King Aethelberht of Kent, in 580 A.D. The pin (see photograph) is 3.5 cm long. Unfortunately, it has suffered structural damage and has been distorted in several places. It has been described as a "bead", or the head of a pin, but it may have been a pendant. Its craftwork is less sophisticated, apparently, than that found on other garnet-inlaid Anglo-Saxon ornaments. The pendant (Ashmolean accession number AN1909.517) is on display in the museum's England gallery. The Museum's records describe it as a "4-sided lentoid bead; gold with cloisons of garnet and blue stone; two opposite sides alike. Length 35 mm." 1. We would like to express deepest gratitude to the Ashmolean Museum and its curatorial staff for assisting with the contents of this article. We are particularly indebted to the Museum for the photograph of the pin, and we acknowledge that the copyright of the photograph of the pin is theirs. 2. The extracted. 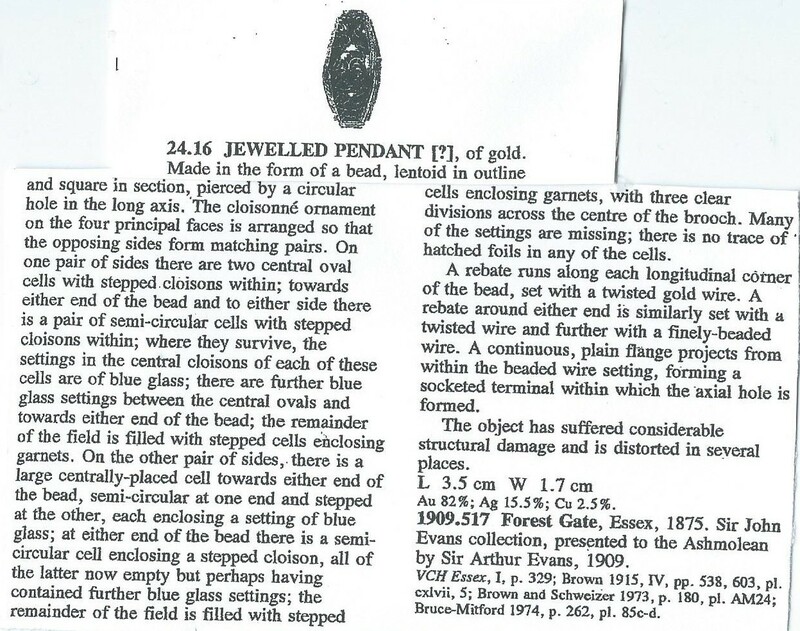 detailed quote, above, describing the pin, can be found on pp 165-6 of Macgregor, Arthur and Bolick's A Summary Catalogue of the Anglo-Saxon collection (non-ferrous metals), published by Ellen in 1993, from British Archaeological Report 230. In our recent article on Forest Gate's listed buildings we mentioned (here) that the Red House, in Upton Lane, was, for a while, home to Mr Tutill, a prominent trade union banner manufacturer. 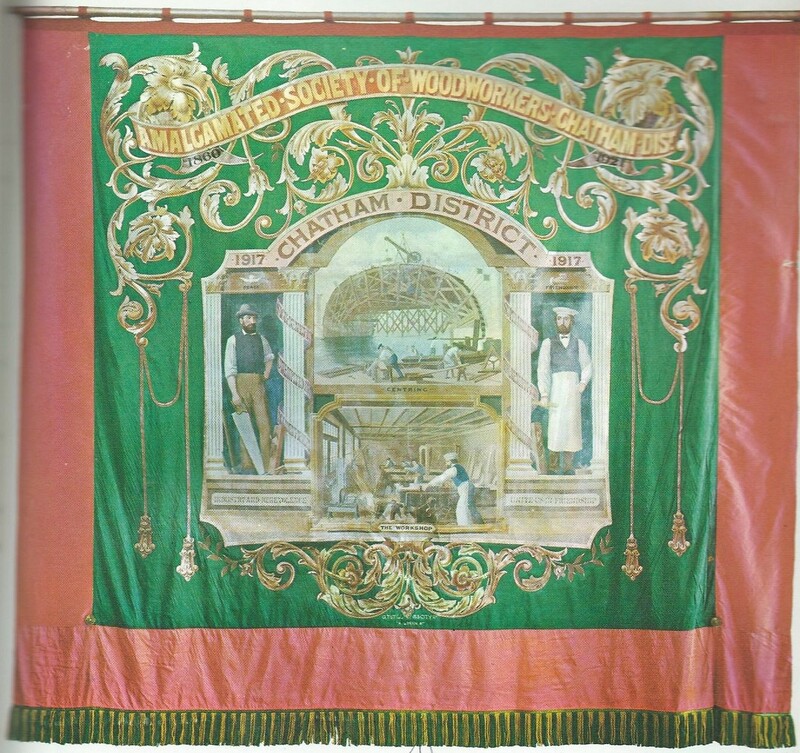 During the 1840's union banners began to be made in the general style which remained in favour for a hundred years: lavishly illustrated on both sides of silk panels, highly ornamental and trimmed up to sixteen feet by twelve feet in size to be paraded in public, stately and striking. 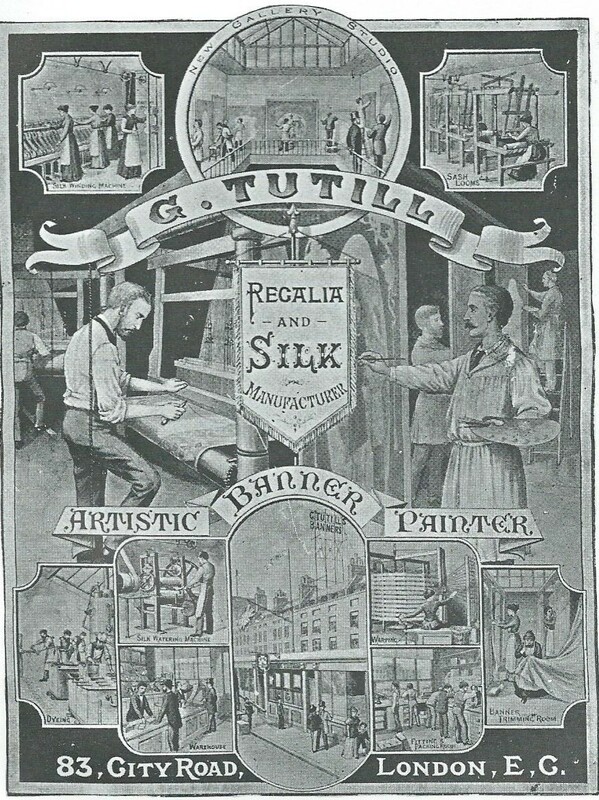 The uniformity, which extended to designs as well as materials was due largely to one man, George Tutill, who set up in banner making in 1837 and over the next fifty years earned for his business a virtual commercial monopoly and a world-wide market. George Tutill lived in Upton Lane's Red House (illustrated above) between 1871 and till his death in 1887. This post is his story. He was born in the Yorkshire village of Howden in 1817, two years after the defeat of Napoleon and two years before the significant Peterloo massacre. His father was an illiterate miller. 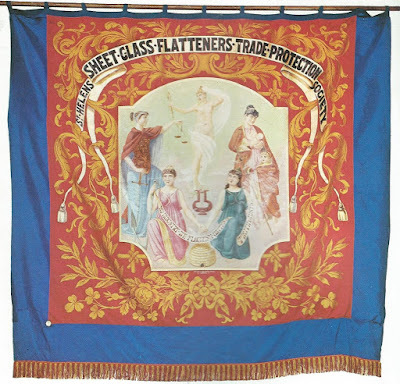 In 1837 the twenty year-old Tutill established the company which was to manufacture more trade union banners than any other in the world- more than three-quarters ever commercially manufactured. Details of his life before 1837 are obscure, but the company he established in that year still survives and is now based in Chesham, Bucks. George Tutill began his life as a travelling fairground showman. In those days ... it was common practice for a showman to decorate his own sideshow, caravan or roundabout, embellishing it with ornate lettering and design, which Tutill did with great style. 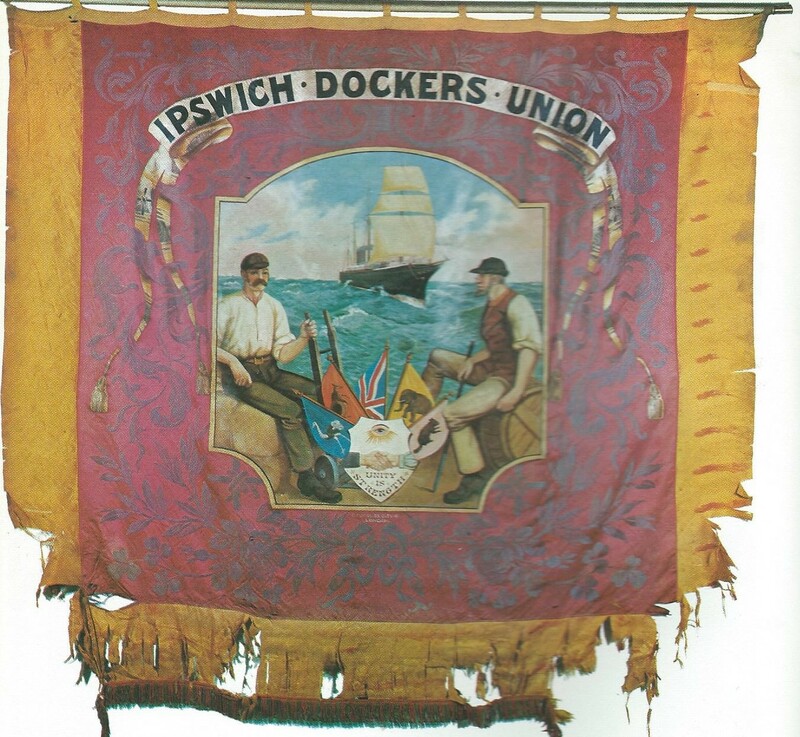 ...Tutill first met trade unionists during his regular visits to public houses (where the union's held their meetings). He also met with the friendly societies for whom he was to produce so much in the years to come. 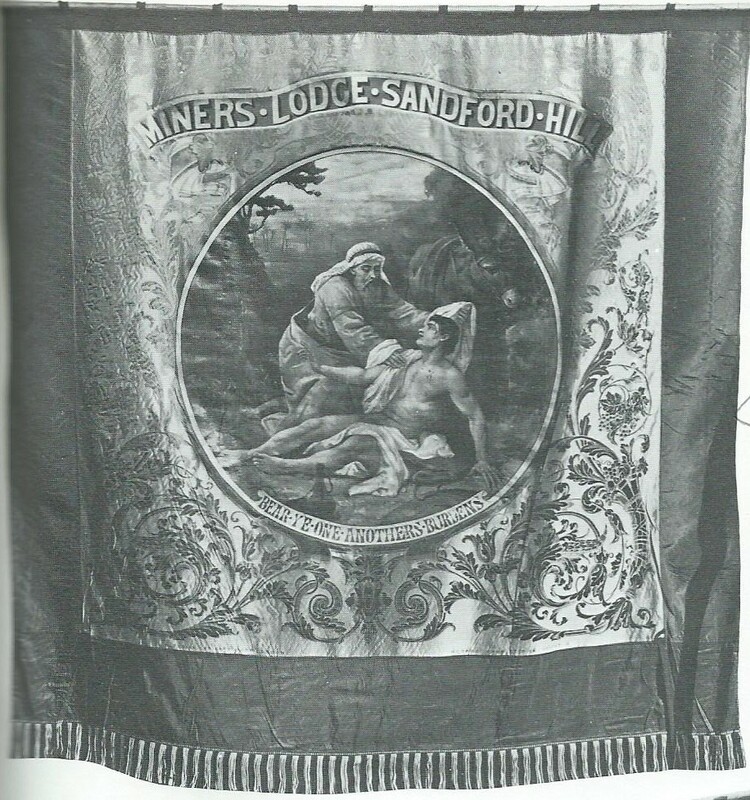 ... On one occasion ... he was asked if he would paint a banner for a union, which held its meetings at the inn. He accepted and the members were delighted with the result. And so began his career as a banner maker. Details of his career over the next few years are patchy. But, as an indication of his artistic talents, a painting of his, entitled Scarborough Castle (a few miles from his native village), was exhibited at the Royal Academy. By 1857 he was living in Islington and soon after he established his business at 83 City Road, in a purpose built workshop.. By 1860 he moved house to Canonbury, a more up-market part of Islington, a sign of his increased success and prosperity. A key to his success was moving banner-making on from a simple artisan workshop activity to an almost production-line process. 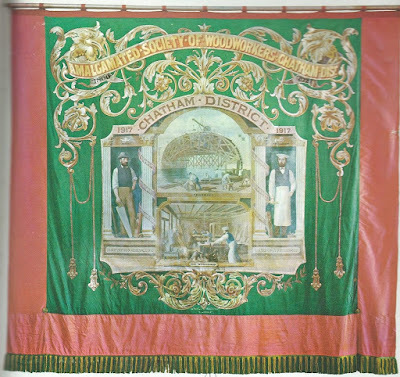 All of his banners were made from pure silk, and he built on the East London, Huguenot-influenced, tradition of silk weaving in Spitalfields and Bethnal Green. 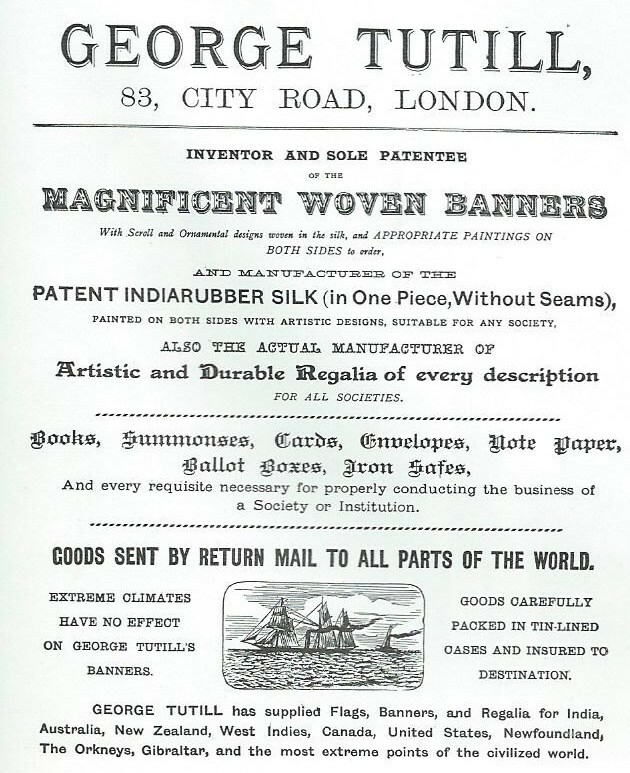 In 1861 he took out a patent for "treating materials for the manufacture of banners and flags". 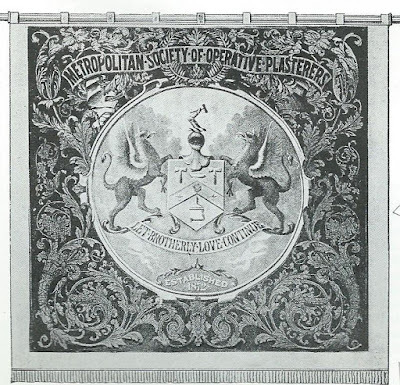 It was designed to give flexibility and durability to the materials he used in the manufacture of flags, where paint and oils were mixed and then covered with a small film of india rubber, to create and preserve the pictures in the centres of his trade mark banners. 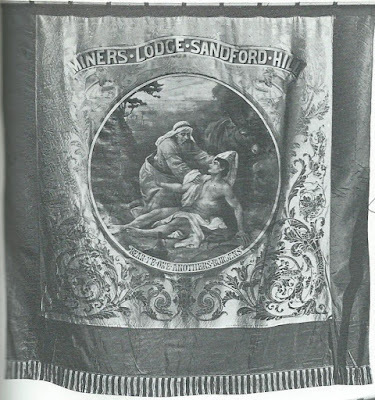 The formula was so successful that some of his early banners survive today (130 years on) - images intact. Satin sashes, printed emblems, aprons, collars, regalia cases, caps certificates, medals, chains, horns, girdles and even robes and false beards for the Ancient Order of Druids supplied insatiable demand. 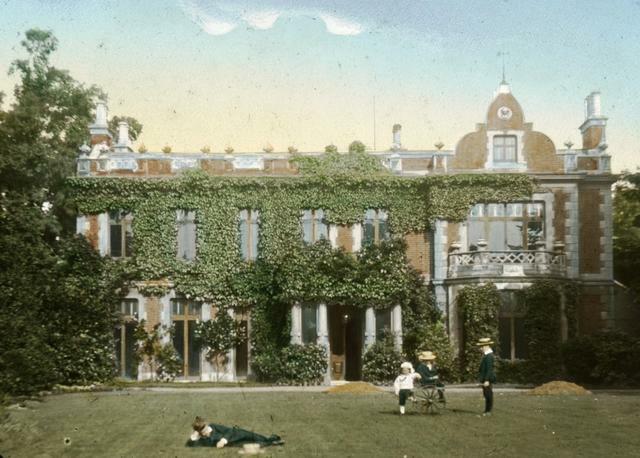 With business flourishing, Tutill continued to prosper and in 1871 moved into the Red House, on Upton Lane. The house, itself had been built shortly before 1762 and had been inhabited by Isaac Blijdesteijn (who became and elder in the Dutch church at Austin Friars, in the City, in 1803), son of a Dutch merchant. Tutill was to live there with his wife, Elizabeth, and their only surviving child, daughter Georgina, until his death in 1887. Elizabeth died in December 1884 and is buried in the near-by Emmanuel Churchyard, in Upton Lane. Tutill was not one to let the grass grow under his feet, in the business world. In 1881 he installed the largest Jacquard loom in the world in his City Road premises, in order to weave the ever larger banners in a single piece. Tutill seems to have embraced all the elements of a successful Victorian businessman, according to Gorman. He was self-made, creative, inventive and boldly kept pace with the expansion of industrial capitalism, at home and abroad. He soon cultivated a successful export business. 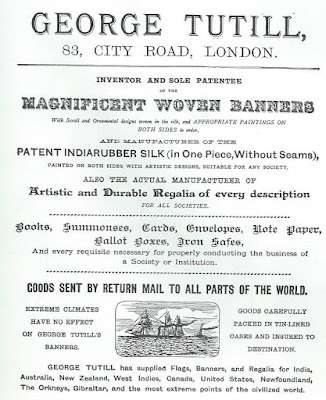 In the firm's catalogue of 1896 (after his death), it stated the firm was exporting banners to Australia, New Zealand, South Africa, Canada and "to the remotest parts of the civilised world"! Tutill, himself, was presented with the highest award, a gold medal, and a special commendation at the Sydney International Exhibition of 1879. 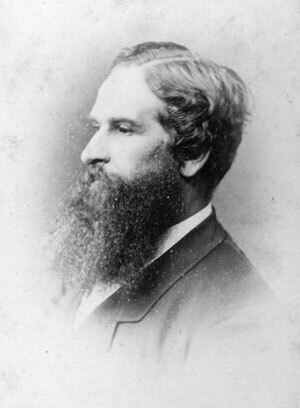 He also took prizes at exhibitions in Brisbane in 1880, Melbourne in 1881 and Adelaide in 1882. He sailed to Melbourne to pick up his award in person. 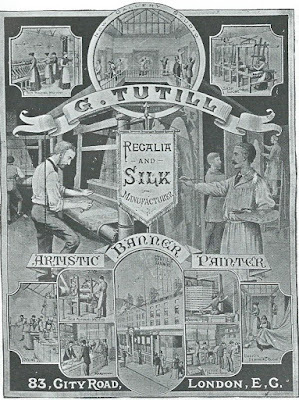 Although, over fifty years, Tutill made more trade union banners than anybody else, he did not share the political or economic sympathies of his clients. He ran a non-union company, which remained so until well after his death, in 1935. He also obtained a great deal of business from the temperance movement, but that did not affect his fairly notorious drinking habits. He is said to have kept two barrels in his office - one filled with whisky for the drinkers and one filled with port for the non drinkers! Tutill was a meticulous artist and business administrator and kept long-hand records of all his correspondence from 1840 onwards. Later he kept photographs of every banner the company produced. The entire collection, however (with the exception of three boxes of negatives from the 1920's) was destroyed in the blitz of 1940. 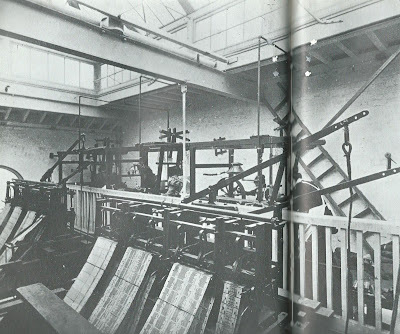 The giant Jacquard loom was removed to Braintree for the duration of the war, to preserve it, but as technology moved on, it became redundant in 1965. It was offered to the Science Museum, who declined, and so it was broken up, for parts. 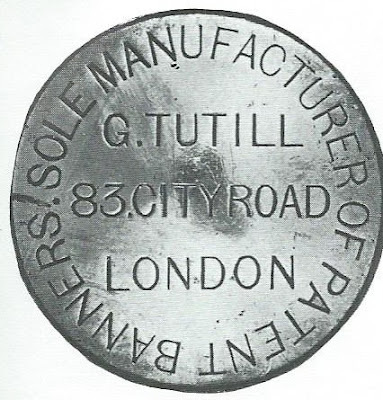 The company itself, transferred to Chesham in Buckinghamshire, following the destruction of its City Road premises, after the Second World War. Back to Tutill, himself. 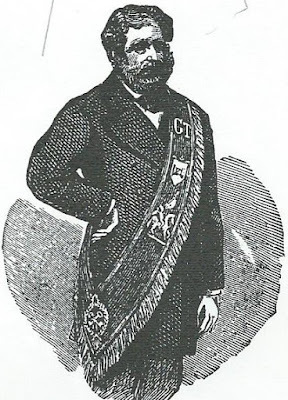 He died on 17 February 1887 at home, in the Red House. A large decorated stained glass memorial window was subsequently constructed at the south west end of Howden Minster. The inscription along the base of the window reads:- "To the glory of God, and in affectionate remembrance of George Tutill, Esq. Born April 16th 1817. Died Feb. 17th 1887. J B Capronnier, Bruxellensis, Fecit 1888." The business passed to his daughter and son-in-law. Thus business continued and prospered in the boom decade on the 1890's. In the twentieth century demand for banners declined until after the First World War, when there was an upsurge in trade union banner making. Following the General Strike of 1926, demand dropped off again, until 1947, when it prospered with post war confidence (and major nationalisations). 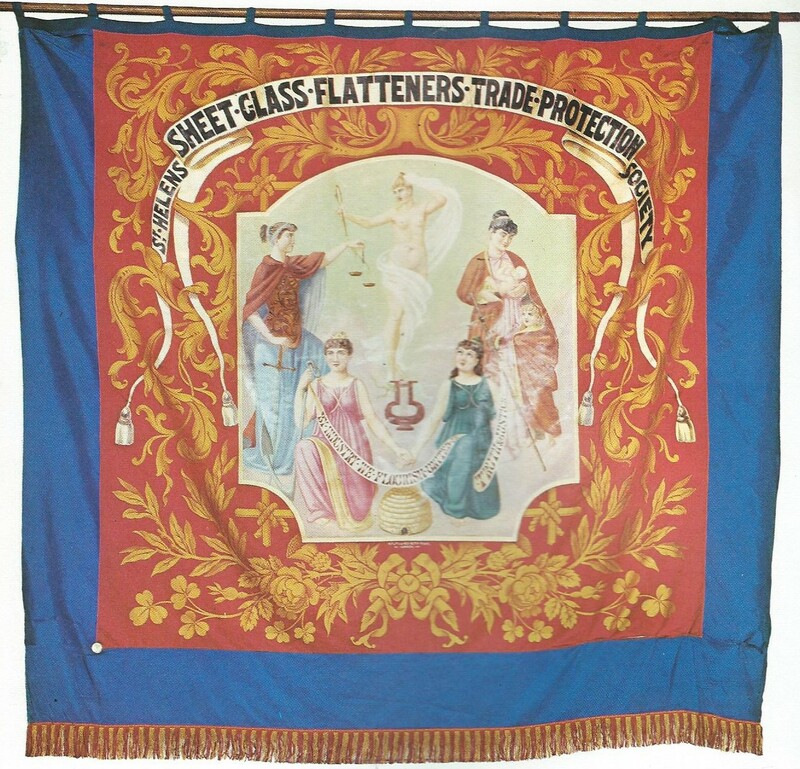 The demand dwindled again until 1967, a year in which the firm of Tutill's did not make a single trade union banner for the first time for 130 years. As far as the Red House was concerned, soon after Tutill's death, it was occupied by the local MP Major George Banes, who served the area until 1900. According to a certificate inside the building, by 1907 it became a local gentleman/workingman's club apparently a gift to the area by a former resident. It is not clear whether this was Banes or not. The English Heritage's version of its 20th century history is somewhat at variance with this.